Setting aside the historical background, the basic principle surrounding this art are the natural elements that influence one’s perception like color, weather, greenery, etc. It was in the late 19th century that scientists realized how ambiance can have a significant impact on the sense of judgment, something that Feng Shui introduced to the world hundreds of years ago. There are a lot of skeptic theories regarding Feng Shui but its righteous implications to the real world even to this day show how this primitive art of living is well rooted within the human behavioral psychology. Literally, "Feng Shui means wind and water". 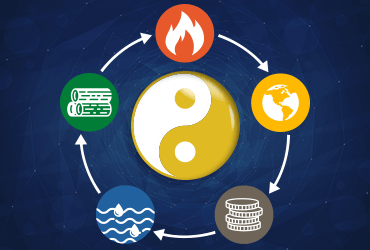 An ancient Chinese concept associating to the relationship between a man’s fortune and the environment. Legends believe, Feng Shui draws similarities from the principles of Taoism, Buddhism, and Shintoism. But the more accurate historic base has to be from the religious Chinese scriptures like Li Shu. It preaches the importance of balance between heaven and Earth or man and nature. After hundreds of years from its origin, Yang Yun-Sung created the first official Feng Shui manual describing attributes of a scenery and its impacts on daily life. Check more: What is Finance Astrology? This book was considered the reference text for all forms of #FengShui until another book was compiled related to different geographical formations, a century later. It lead to the introduction of target points which later became the school of Compass. The modern-day Feng Shui that we know today is a blend of two systems - the traditional countryside, and the modern mountains and rivers ideology. The art of Feng Shui has been around from as late as Ninth century B.C and it’s still very popular. Earth: Represents strength and stability. Helps in building strong and long-lasting relationships. Including Earthy tones such as brown, light orange, yellow will strengthen your bond with your loved ones. Adding items made of Earthly extracts such as clay and ceramic will be very beneficial in the same context. Earth element is the crux of the entire system and needs to be in the center of the room or the house. Metal: In Feng Shui, metals represent financial aspect. If you wish to make more money or improve your financial status, then you should add more metallic items to your home decor. Items colored silver, golden, copperish should be placed in the Western corner of the house. Water: Items such as fountains, aquariums, help enhance communication between the people in the house. If you can’t add figures that have water, you can add objects made out of glass. The corner for water element is North. Try and place these items towards this direction. Wood: The element of Wood represents faithfulness and also helps in expressing creativity. Wood is the most commonly used material in every house. There can be plenty of ways to incorporate wooden designs and decorative items. Apart from the natural brown color, you can also use green objects to invoke the wood element. East is the direction for the Wood element. Fire: Fire is regarded as the most powerful and influential element of them all. Therefore, you need to be extremely careful while adding this element to your house. It symbolizes passion and efficiency. As per Feng Shui, Southern corner of the house is considered to be the right place for fire element. Finance: One of the primary reasons for Feng Shui to flourish around the world is the fact that it attracts wealth. The element of water is often associated with wealth acquisition. Career: According to the traditional Feng Shui scriptures, open spaces in your house influence career. A person’s growth depends upon the positive area that you’re surrounded by. Love: Nature goes hand in hand with romance and love. It is probably one of the most important reasons why people seek Feng Shui to get their way clear when it comes to love. Feng Shui provides some excellent natural techniques to attract people especially your loved ones. Feng Shui has proven beneficial in fields such as marriage, health, relationships, and social status. Practically, it is worth a shot as it combines two very basic aspects of life, nature, and mind.